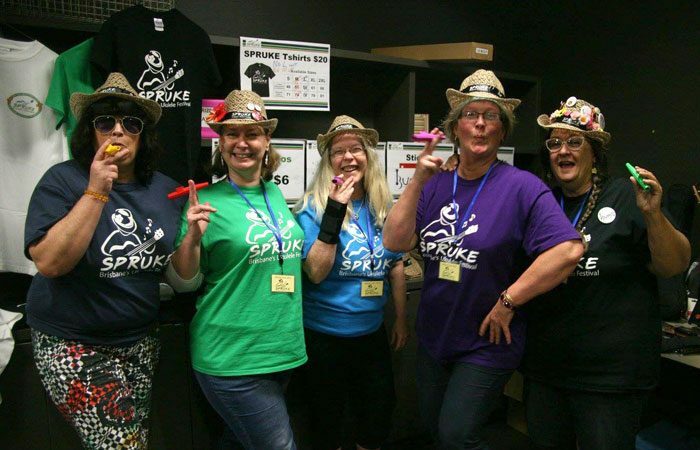 The SPRUKE Crew love playing their ukes, having a laugh and lending a hand. Volunteering as a SPRUKE Crew member gets you industry experience and festival perks, not available to the regular SPRUKE festival-goers. • Join the behind the scenes action, rub shoulders with a Ukulele Star, and make new friends. • Enjoy reviving refreshments to keep you powering through your shift. • Return your volunteer’s lanyard after your first shift to receive a discount voucher for BUMS Inc and SPRUKE merchandise. • Earn the everlasting gratitude of the SPRUKE 2019 Festival Committee. Everybody has talents and skills … share yours and help make SPRUKE the friendliest ukulele festival. Here’s how you can spend your volunteer time. Thanks to all those who took part, SPRUKE 2017 was a great success. The enormous wealth of talent within the volunteer ranks, created a very polished and professionally run event. We were thrilled by lots of very positive feedback about how smoothly it ran. Festival-goers and our SPRUKE CREW also enjoyed the participatory and inclusive feel of the festival. We want to build on that to make the SPRUKE 2019 even better. We have a new festival precinct this year, SunPAC and the adjacent Sunnybank Community and Sports Club- good news it’s air conditioned! Festivals like SPRUKE rely on generous and enthusiastic volunteers. We need you again! Register here as a SPRUKE volunteer. If you’ve had experience, we’d absolutely love to hear from you. If you don’t, we’ll provide you with a solid grounding in what’s required. Help us to deliver a first-class festival experience. We are looking for people to join these festival teams. I'm happy to do just about anything. The length of volunteer shifts will vary according to roles. The shifts can range from 2- 5 hours.Please indicate your preferred timeslot/s for volunteering. Thank you for volunteering for SPRUKE. Our SPRUKE Crew Coordinator will contact you shortly.